The following poem by Thomas Hardy is a combination of objectivity and subjectivity. The first two stanzas are descriptive; they set the writer to thinking. The second two express the writer’s consequent thoughts. The setting is a passenger compartment on an old steam train chugging through the south of Britain in the early 20th century. 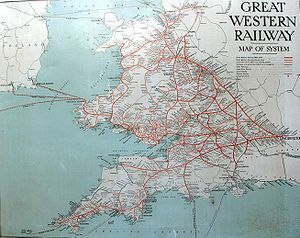 It is the Great Western line, which ran from London across the south of England and all the way into Wales. Our poet — Thomas Hardy — is on the train as it passes through the darkness, and he is awake at midnight, looking at and pondering a boy travelling alone, his form revealed by the dim light of the oil lamp suspended from the roof of the carriage. The boy and the writer are travelling — as did most people — in the cheaper third-class seats rather than in first class. One has the feeling, from the description, that the poet is seated opposite the boy, who is sitting there listlessly and sleepily — seemingly without energy or interest in anything around him. His body is relaxed and slumped, his face blank. We see this by the dim, dingy light of the oil flame burning in the roof lamp, the light that feebly illumines the compartment. The boy is so absorbed in his sleepy abstraction that Hardy says he is “bewrapt past knowing” — wrapped up in his weariness and lack of thought to the extent that he is not thinking about where he is coming from or to what he is going; he has no concern for past or future. The boy is wearing a hat, and the hat has a band about the lower part of the crown, and in that band his ticket is stuck for convenience, so that anyone checking may see it immediately. And around the boy’s neck is hung a string, and from that string a metal key is suspended. It is the key that opens the boy’s travelling-box, his “luggage” as we would say. The key “twinkled gleams of the lamp’s sad beams,” meaning it reflected flashes of light from the roof lamp as it jostled while the carriage kept up its gentle shaking. This flashing reflection of the lamp makes the key seem almost like a living, moving thing. Hardy wonders what the boy’s past must have been like to make him seem so uninterested, so lacking in curiosity about what future might await him, so without interest on “all at stake” meaning his whole life ahead. What could have given the boy such calmness as he undertakes “this plunge alone” — this journey into the unknown, travelling with no one watching over him? Hardy asks if perhaps the soul of the boy — his inner being — is not really in or from “some sphere,” some realm far beyond our earthly, rude, everyday realm, from which the boy with wider sight than ours looks down and measures (“metes”) — evaluates — what goes on in our rude material realm, “this region of sin” that the boy finds himself in, “but is not of.” The boy to Hardy seems quite innocent, as though he had some supernatural knowledge of things that has made him quite unconcerned with matters on our worldly plane of existence. How else could the boy be travelling alone, plunging through the night from past to future, and yet be so unconcerned about everything in this world so filled with troubles? It is, of course, just a poet’s musing, but Hardy shows us, through his thoughts, what a dark place he considers this world to be, and he thinks this calm, innocent boy must surely see things from a higher realm than we are able, given that he seems to pass through the darkness of our earthly realm so unconcernedly. We can take this midnight journey, if we wish, as a metaphor for life. We come from the unknown and pass to the unknown. Gauguin wrote on one of his famous Tahitian paintings, “D’où Venons Nous… Que Sommes Nous…Où Allons Nous?” — “From where do we come? What are we? Where are we going?” It is the universal, human, unanswered question. And it is certainly the question in Hardy’s mind as he watches the languid boy sitting half-asleep across from him, the light flickering from the metal key suspended about his neck as the softly jerking train carriage passes on through the midnight darkness. Creder lo o non, le primavera ha comenciate. Hodie es Candlemas, anque nominate Imbolc. Le celo es azure e le sol brilla. 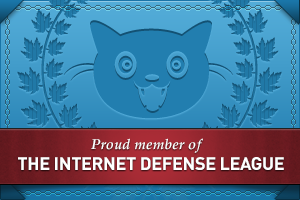 Iste es un hokku del comenciamento de primavera. Le frigido hibernal non ha evanescite in toto, ma remane in le matino. Ma ora le energia yin se reduce, e le energia yang cresce. Nos vide le energia yang in le alba e in le folio verde de hordeo, e nos vide le energia diminuende de yin in le gelo al puncto del folio, que tosto va disparer quando le sol ascende. Iste hokku de Onitsura monstra ben como hokku exprime le natura de un saison del anno — aqui le primavera. Nos vide tamben que le hokku es dividate in due partes: un parte longe e un parte curte. E le hokku tene un scena — le alba, un subjecto — le gelo, e un action — le remaner del gelo al puncto del folio de hordeo. In le photo on vide le Homo Verde (le primavera — le energia yang del saison) qui lucta con Jack Frost (le gelo del hiberno — le energia yin). Iste es un celebration anglese de Imbolc — del comenciamento del primavera. Believe it or not, spring has begun. Today is Candlemas, also called Imbolc. The sky is blue, and the sun is shining. This is a hokku of the beginning of spring. The cold of winter has not vanished completely, but remains in the morning. But now the yin energy diminishes and the yang energy increases. We see the yang energy in the dawn, and in the green leaf of the barley, and we see the decreasing energy of yin in the frost on the tip of the leaf, which soon shall disappear when the sun rises. This hokku of Onitsura shows well how hokku expresses the nature of a season of the year — here, the spring. We see also that the hokku is divided into two partes: a long part and a short part. And the hokku has a setting — the dawn, a subject — the frost — and an action — the remaining of the frost on the tip of the barly. In the photo one can see the Green Man (the spring — the yang energy of the season) fighting with Jack Frost (the frost of winter — the yin energy). 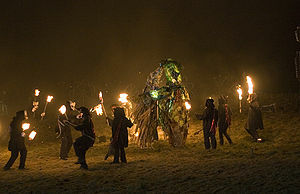 This is an English celebration of Imbolc — of the beginning of spring.